Often, when a work is allotted to a person who is being paid for doing that work, a time period is considered and given to the worker for completion of the work. When this type of situation arises for giving works to a lot of people, recording the time taken by each of the workers to complete their works is difficult. In case of such a situation, different types of daily Timesheet Templates can be used. Here are some instances. The simple looking daily timesheet template can be used for recording the time allotted for different kinds of jobs given to a person. It displays designated and underlined spaces for filling in the name of the task doer, the department he/she is working for and the various kinds of tasks given. 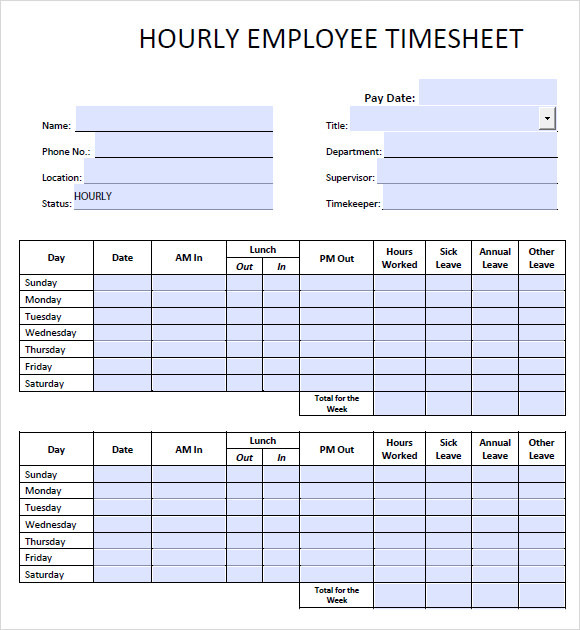 The hourly timesheet template can be used for recording the number of hours taken by a member of staff of a department or company to complete a task given to him/her. In other words, this template is used to record time given for each task to a worker on an hourly basis. 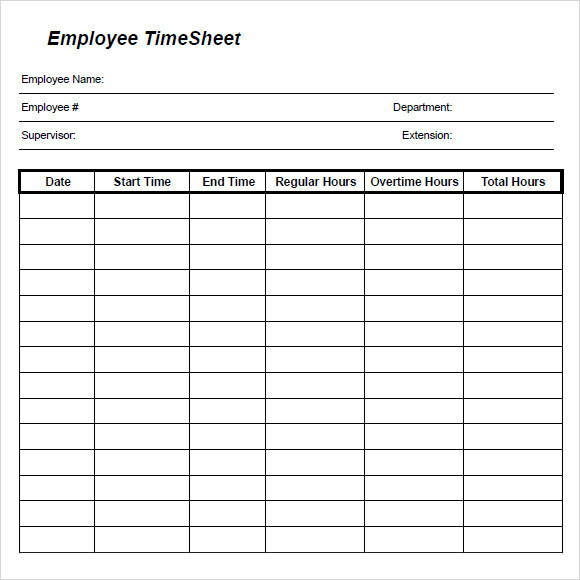 The employee timesheet template is used in many offices to record the time of start and the time of end of a work or job that is given to an employee. It is quite simple to look at. It has designated laces for writing the name of the different jobs. 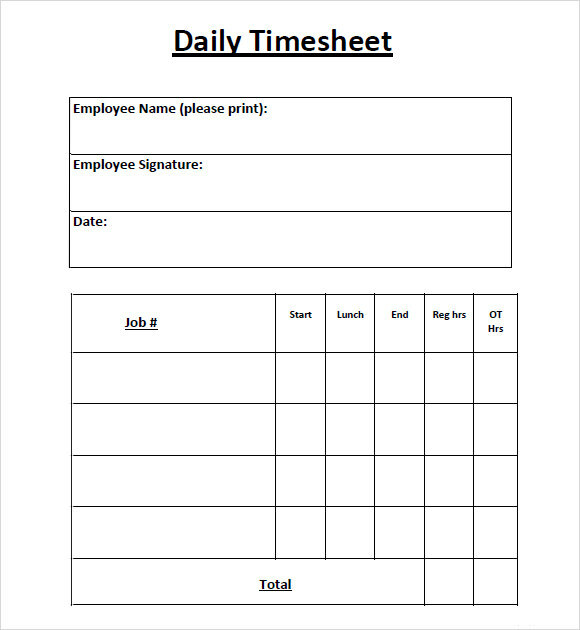 Daily timesheet templates are very useful for offices and departments with a lot of workers and employees. They can be used to keep a track and record of the time of start and the time of end of different kinds of jobs given to the different employees of the department. They serve as a big help to offices to test the skill of new employees. You can also see Weekly Timesheet Templates. 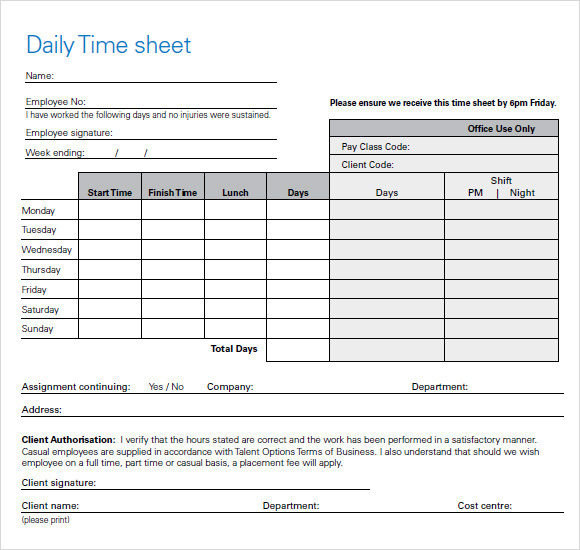 When is a Daily Timesheet Template needed? Daily timesheet templates becomes a big need for offices when they have a lot of jobs to get completed by their employees and on the basis of the information filled up in the daily timesheet template, they have to decide the wages of the employees. Also, when an office has newly recruited an employee, they can use a daily timesheet template. Daily timesheet templates can be very beneficial and efficient to an office with a lot of desk job to get completed by their employees. 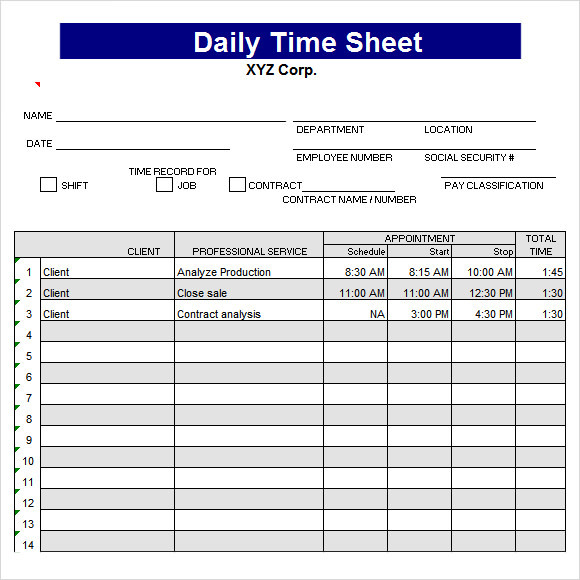 Daily timesheet templates can be used for various purposes and jobs. 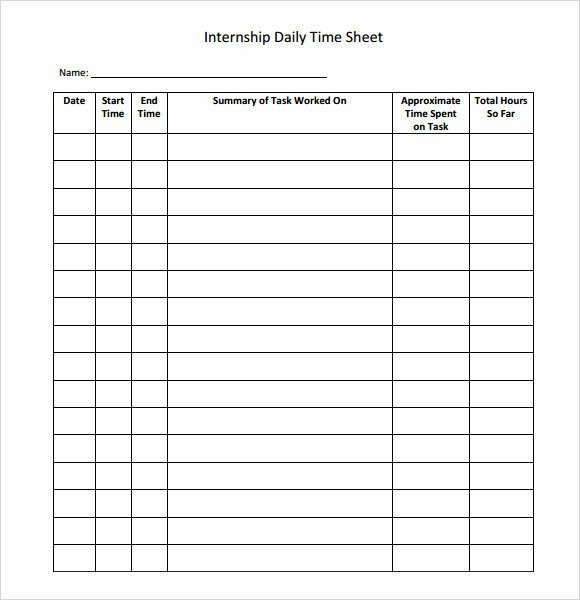 A daily timesheet template can also be used by a candidate or student who wants to increase his time management skills and work for a company. You can also see Blank Timesheet Templates. 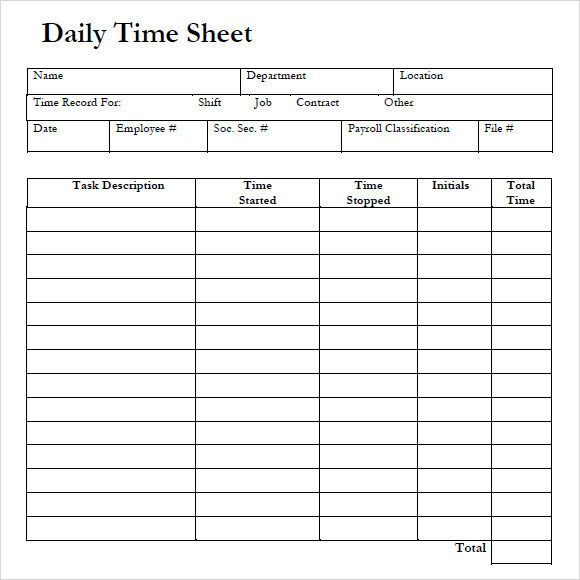 Daily timesheet templates are of different types depending on the kind of job or purpose for which they are to be used. Therefore, when a person wants to get a daily timesheet template, he/she should always keep in mind the purpose of getting it. If a daily timesheet template is needed for a company, it must be checked if it is editable or not. You can also see Payroll Timesheet Templates. Daily timesheet templates come in different file formats such as PDF file format and Excel file format. 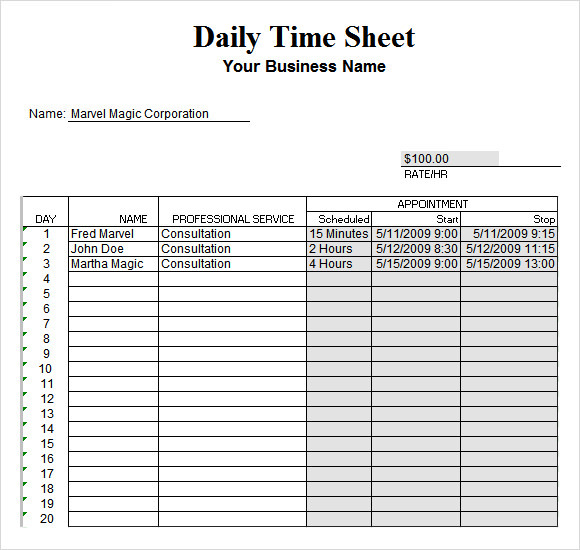 Nowadays, daily timesheet templates are easily available and downloadable from the internet. They are also easy to print. Some of them come as easily editable and customizable daily timesheet templates with space for logo.